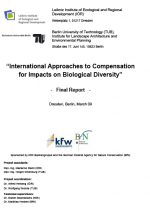 The starting point of this research project is the UN Convention on Biological Diversity (CBD). Through the ratification of the CBD, member countries have made a commitment to support the conservation of biological diversity. In the sixth Environment Action Programme 2001 – 2010 ( Our Future, Our Choice ) the European Union established the preservation of biodiversity as a central aim of European environmental politics and subsequently established a European Biodiversity Strategy. Germany is a contracting party to the CBD and has recently enacted and defined its National Biodiversity Strategy.